This text is adapted from “Tear Gas: From the Battlefields of World War I to the Streets of Today” and was first published in Waging Nonviolence. 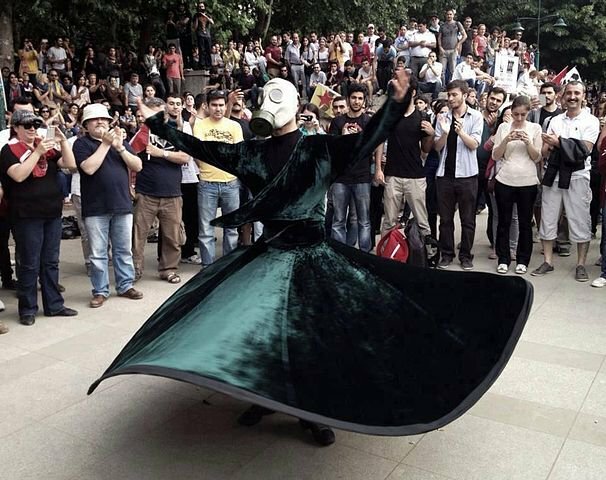 A whirling sufi wearing a gas mask during the 2013 protests in Turkey in Gezi Park. Credit: Wikimedia/Azirlazarus. Creative Commons Attribution-Share Alike 3.0 Unported license. In places like Bahrain and Palestine, widespread and even daily use of tear gas has made this chemical weapon a part of life. As a way of exhibiting and collectively processing this trauma, people sometimes transform tear gas canisters into other objects. Acts of anger, grief and memorializing emerge as artistic practices. For example, in Bahrain, people designed a throne made out of tear gas canisters to signify their royal family’s role in the suppression of democracy protests. In Palestine, tear gas canisters have been used as Christmas tree ornaments to send a holiday message to the United States about the role of its tear gas and arms manufacturers in the violence of the Occupied Territories. In 2013, images of a Palestinian garden made out of plants potted in empty tear gas shells went viral, picked up by mainstream media outlets as an image of hope and quiet resistance. Yet, as Elias Nawawieh pointed out in +972 Magazine, absent from the news stories, Twitter photos and Facebook posts was the grave built as the garden’s centerpiece. It bears a translucent photo of Bassem Abu Rahmah, who was killed by the IDF in 2009 after being shot in the chest at close range by a tear gas grenade. These objects were as much about material reality as symbolism. Protesters in Gezi borrowed, translated, and reproduced instructions for making a gas mask out of a plastic bottle, and for using Maalox and other household ingredients as remedies for the painful effects of tear gas. Talcid Man appeared after a rumor spread that Talcid (a liquid medicine to relieve stomach inflammation) could help ease the effects of pepper spray. He emerged onsite, distributing the medicine as an embodied mobile care unit, and became a symbol of the movement’s resilience and generosity—depicted in stencils and sketches that circulated far beyond the occupied park. In 2014, Bahrain Watch launched a #stoptheshipment campaign targeting Korean manufacturer Dae Kwang Chemical, which had contracted to supply more than a million canisters of tear gas to Bahrain—a country where more than 40 people have died and thousands more have been injured as a result of tear gas. Campaigners worked with Amnesty South Korea, Korean unions and local campaigns, as well as journalists at agenda-setting publications such as the Financial Timesand New York Times. These longstanding tactics were combined with sophisticated, contemporary uses of social media, including a catchy, action-based hashtag, timed retweets and a campaign-specific website. They succeeded in pressuring the South Korean government into placing an embargo on tear gas to Bahrain, stopping the Dae Kwang shipment. In October 2013, the Facing Tear Gas campaign brought together organizations to protest against Urban Shield, an annual SWAT team training session and security sales expo that promotes the use of military tactics for protest policing. The campaign built a coalition of more than 30 local groups in Oakland, including the Oscar Grant Foundation and the Arab Resource and Organizing Center. The next year they came back more organized, more informed and determined to make a difference. They created online petitions, held dedicated coalition-building meetings with council members, adopted a preemptive press strategy, and staged a demonstration outside the expo site that drew hundreds to the streets. Their efforts paid off: The Alameda County Sheriff’s Office announced that Urban Shield would no longer be held at the Marriott, and Mayor Jean Quan said that the City of Oakland would not renew its contract with Urban Shield. This was a small victory in a much larger struggle to change policing policies and practices. In addition, social media has changed PR, making image management a two-way process where customers’ influence is bigger than ever before. This transition is expanding the field of image-based activism, as people find key image locations—moments and partnerships—that are ripe for intervention. While this can appear to be auxiliary, targeting theaters or museums sponsored by arms dealers hits PR teams where it hurts. In this case, by linking Urban Shield to ongoing events in Ferguson and to Oakland’s past cases of police brutality, particularly against young black men, the Stop Urban Shield coalition’s multi-ethnic, queer membership made it impossible for the city council to support the expo without further damaging the city’s image. It is not an easy thing to question the principles and protocols that shape your job and the way it is done. While my focus has been on advocacy from the outside, there are also a number of ways you can help transform how police are trained from the inside. In doing so you are likely to upset others around you, and you will certainly upset all those private consultants and experts who make money off the Saturdays you spend in their classrooms. Yet, by speaking out from within, you will be joining the ranks of many officers who have fought against the way excessive force is taught, enacted, and then covered up and protected within police departments. You will be speaking out against the cycles of trauma that can produce and perpetuate unnecessary uses of force. Change cannot just be about better public relations; it must also come from the bravery of speaking out from your heart and mind against systems you know are broken or corrupt. Tear gas must also be considered in its material form—as an object designed to torment people, to break their spirits, to cause physical and psychological damage. No amount of corporate public relations or safety guidelines can hide that foundational truth of chemical design. Tear gas is a weapon that polices the atmosphere and pollutes the very air we breathe. It turns the square, the march, the public assembly into a toxic space, taking away what is so often the last communication channel people have left to use. If the right to gather, to speak out, is to mean anything, then we must also have the right to do so in air we can breathe.